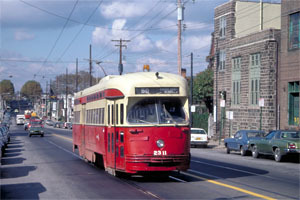 In the late 1970s, Philadelphia's fleet of PCC cars was the second largest in the western hemisphere, with 300 PCC trolleys remaining -- only Toronto Ontario had more trolleys. 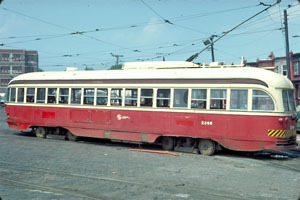 Philadelphia's fleet was comprised of two main classes: 102 prewar "air cars" built between 1940 and 1942, and 198 postwar "all-electrics" built in 1946 - 1948. The streetcars operated from three depots over twelve routes, spread over most of the city. 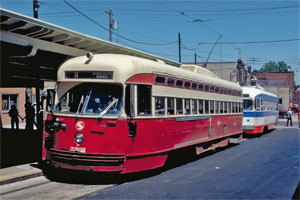 Five car lines ran on city streets and through a trolley subway under University City and Center City; the remaining seven ran entirely in city streets in traditional streetcar fashion. Much of the system has been paved over since then. Today, the five routes that operate through the Subway Surface tunnel and in southwest Philadelphia are equipped with Japanese-built Light Rail Vehicles. Of the six North Philadelphia lines, only one, the Route 15 Girard Avenue, has been restored to streetcar service. Until 1992, rebuilt postwar PCCs remained in revenue service on three lines, the 15, 23, and 56. PCC cars on these last three lines were "temporarily" replaced by diesel buses in September of that year, with most of the PCCs sold to transit operations and museums all over the country. The tracks and wires remain in place however, with both City Council and the mayor's office opposed to their removal (see City Council hearing article). SEPTA has restored service on Route 15, but has no plans to bring trolleys back to Routes 23 and 56. Portions of both Route 23 and Route 56 have been paved over. September 1992: Routes 15, 23, and 56 become "temporary" diesel bus lines. Most of the PCCs are sold. December 1995: SEPTA ends "Welcome Line" trolley service, which connected Center City with the Philadelphia Zoo. June 1996: SEPTA discontinues"Chestnut Hill Trolley" weekend-only service on the northern end of Route 23. September 1997: SEPTA announces plans to re-instate trolley service on the suspended Route 15. November 2001: The SEPTA board votes to approve the remanufacture of 18 to 26 postwar PCCs for Route 15 service. September 2005: Rebuilt PCC cars restore Route 15 trolley service to Girard Avenue. 2008: PennDOT built new Route 23 tracks and wires in Mt. Airy, while at the same time SEPTA removes rail on Route 23 in South Philadelphia. During the late 1990s, between Thanksgiving and New Years, SEPTA operated three PCC cars through Center City and South Philadelphia over the idled Route 23 rails. Called the "Holiday Trolley," the PCCs operated four days a week on a twenty-minute headway, with some trips extending as far south as Snyder Avenue. During the 2001 holiday season, with Center City inaccessible due to track reconstruction on Girard Avenue, SEPTA operated the Holiday Trolley in University City. Two PCC cars ran over the diversion tracks from 40th and Market Street to 49th and Woodland Avenue. The PCCs were run every 20 minutes from 11:00 a.m. to 5:00 p.m., Thursdays through Sundays until December 23. SEPTA's recent removal of rail at 12th & Bainbridge Streets takes away any chance of trolley operation through Center City for the foreseeable future. Click here to see an all-time roster of Philadelphia PCCs. Click here to see Philadelphia trolley map. You may click on any photo to view a high-resolution image. Click on the PTC trolley image at the top of the page to see how that graphic was made. While today, Philadelphia's streetcars are being sold to transit operations all over the country, there was a time when Philadelphia bought PCCs from other cities. In the 1950's, PTC bought forty ex-Kansas City Missouri PCCs, and another fleet from St. Louis, MO. 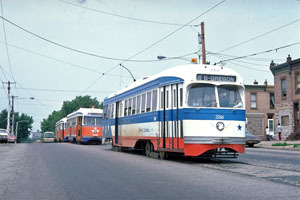 The ex-St. Louis cars didn't last long, but the Kansas City cars were to remain in service here into the mid-1980's. For the U.S. Bicentennial, SEPTA repainted the surviving twenty-seven Kansas City cars red white and blue, and lettered them for the original colonies. They were the mainstays of Route 50, which ran past Independence Hall. According to Howard Fritchman, Jr., quoted in Mervin E. Borgnis' An Inside Story of the PRT and PTC, the ex-Kansas City Cars were the fastest PCCs in the city: "...they had a unique 'overdrive' feature...once this (apparently) top speed was reached, an even greater speed could be attained by easing up on the power pedal to an almost off position, at which point the car seemed to attain a second wind...speed of as much as fifteen miles an hour faster could be attained." Eleven more ex-Kansas City cars came to Philadelphia, by way of Toronto, in 1976. Although these cars were purchased to replace some of the PCCs lost in the Woodland Carbarn fire, they were assigned to Luzerne Depot. 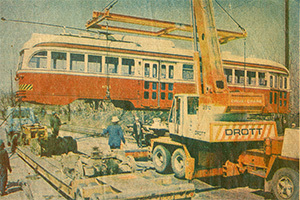 TTC 4750, soon to become SEPTA 2240, as it's lifted from railroad flat car onto flatbed truck in March 1976 at the Penn Central freight yard in West Philadelphia. Photo by Joseph MLaughlan; clipped from the Philadelphia Bulletin. The Kansas City cars are the only ones built with the postwar body shell without small standee windows above the main windows. The president of the Kansas City Public Service Co., Powell Groner, disliked "those little apertures," and in fact the cars built to his specification had a less cluttered appearance than the standard postwar cars. All the Ex-Kansas City PCCs were out of service by the mid-1980s. The car shown here, no. 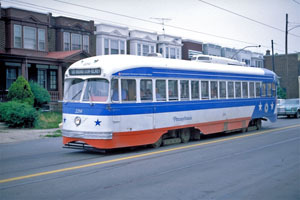 2289, was retired by SEPTA before the rest of the fleet was, in the late 1960s. 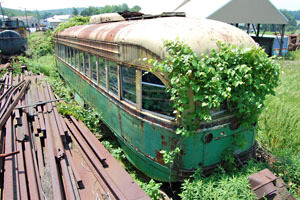 For decades it rusted in a field in Geigertown, Pennsylvania, still in PTC green. For more views of 2289 rusting in peace an an update on its status, follow this link..
Ex-Kansas City car 2255 was saved from the scrap heap by the Buckingham Valley Trolley Association. 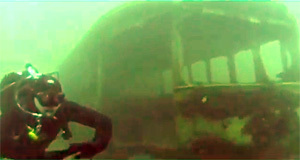 But, because the trolley was vandalized while in storage in Philadelphia, 2255 was deemed beyond restoration and was scuttled in a flooded quarry for the amusement of scuba divers. To view a haunting video of 2255 as it appears today, follow this link to an excellent video replete with Pink Floyd soundtrack. Of the 600 or so PCCs that have rolled over Philadelphia's streets, all but 19 were built by the "Quality Shops", the St. Louis Car Company in Missouri. 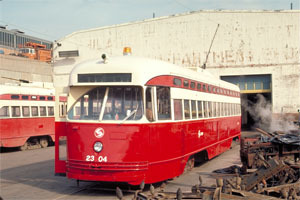 Only the small fleet acquired from Toronto in 1976 were built by the other U.S. manufacturer of PCC cars, Pullman-Standard. These cars were originally built for Birmingham, Alabama in 1946. SEPTA never did repaint its Pullman PCCs in SEPTA colors. But as this photo attests, SEPTA repainted at least one in Toronto red. Some of the Pullman PCCs bought from Toronto had severe corrosion problems, i.e., they were real rusty. This car is coming apart where the plywood floor meets the dash panel above the anticlimber. Like the ex-Kansas City cars, they were assigned to Luzerne Depot. Here 2311 rolls northbound on Route 50, on Wyoming Avenue in front of the old SEPTA headquarters. Return to Philadelphia Trolley Tracks.